How To Find Malware On Computer? | What is Malware? Do you want to learn how to find malware on your computer and get rid of them fast? Malware is a type of software created with the intent of damaging the victim's computer, steal private information or spy on a computer without the consent of the user. It is one of the biggest security threat today and is the cause of most cyber attacks. 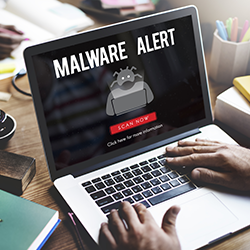 This article will provide a brief description of malware, how they spread and what is the fastest way to remove them. How Does A Malware Get Into A PC? Most of the time, this malware enters a computer when the user downloads an infected application like movies, music or other software applications from dubious websites. Similarly, malware can get into your computer if you click on the links from suspicious emails sent from unknown email addresses. Malware is a form of malicious code that can infect a computer system without the permission or knowledge of the user. The term 'Malware' includes many types of malicious programs like worms, viruses, trojans, spyware, adware, rootkits, etc. So, if someone says malware, it could be of any malicious programs. It could be spyware which secretly steals sensitive information, or it could be adware which bombards the victim's computer screen with popup advertisements. In most cases, malware enters the computer via the internet. Whenever the computer gets connected to the internet, it gets exposed to numerous online malware threats. Hackers often disguise the malware as a useful app or software. Unwary users download the malware considering it as a safe software application. Once installed, the malware then begins to damage the computer or do what the hacker intends to do. How To Find And Remove Malware? To find and remove malware safely, download a good antivirus product like Comodo Antivirus that which can detect and remove malware. Trying to do it manually can be time-consuming and may even cause unnecessary damage to your computer system. You might accidentally delete system files in the process. So, it is better to install antivirus software and scan your system for potential malware. As far as businesses are concerned, it is advisable to get an advanced endpoint protection software to deal with malware. Since there may be multiple endpoints deployed across different locations, regular antivirus products are not a viable option. Products like Comodo Advanced Endpoint Protection (AEP) are specially designed for such scenarios. With a 'Default Deny' platform and lightweight client, Comodo AEP can quickly prevent malicious programs across endpoints without affecting end-user experience. Try Comodo Advanced Endpoint Protection today and secure your endpoints once and for all! For more details, contact us at EnterpriseSolutions@comodo.com or +1 888-256-2608.